One of the reasons I love Oregon is because water feeds my soul like nothing else, and Oregon has plenty of it. Rain, of course, but also the Pacific Ocean, large. powerful rivers like the Columbia and small, intimate creeks like Golf Creek that runs below my balcony. Oregon also features some amazing waterfalls. Multnomah Falls in the Columbia Gorge is probably the most famous, and it’s beautiful. Looking for a change, I visited Silver Falls State Park this week and got to see some lesser known but spectacular waterfalls. Some, like the South Falls and Lower South Falls you can actually walk behind the waterfall which is an experience not to be missed. I hope you get a chance to visit Silver Falls State Park or find other great natural beauty near you! Oh, wow, Nicole. These are amazing. I love the photos! I really think your lovely part of the country would suit me very well. Thank you for sharing the amazing photos. I hope I'll get the chance to visit the waterfalls someday. Thanks for sharing these lovely photos! So pretty! New follower here. 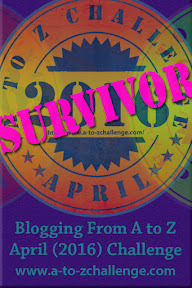 I'm stopping by from the "A to Z" challenge, and I look forward to visiting again! Lovely post. This is why I am happy to be following you. A peaceful moment with your photos. Thanks! Thanks, folks, for stopping by and for following the Writer's Retreat! We'll be announcing a revamped website soon, so keep your eyes peeled. We're glad you're here! Love the pics- can't wait to visit that part of the country myself!